Udaipur in Rajasthan, is often called the most romantic city in India because of its famed lakes and palaces. Therefore it’s only natural that they feature prominently in the list of top Udaipur attractions and places to visit. Experiencing Udaipur is all about reliving royalty and appreciating the city’s man-made beauty. Udaipur is a popular tourist destination in India. The lakes, palaces and lively workspaces and culture attract foreign and domestic visitors. Udaipur is well known for palaces, lakes, temples, museums, gardens & many more. We put together a list of the top tourist attractions in Udaipur, India; on the basis of how many times tourists visited this place. 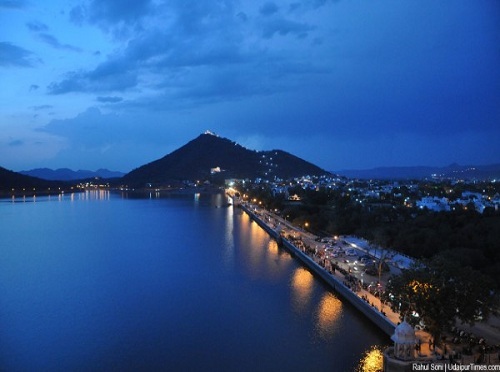 Dudh Talai is a one of the most beautiful place in City Udaipur. Dudh Talai is another tourist attraction of City Udaipur. Dudh Talai is a small lake that adores the south-east direction of Pichola Lake. Located in the southern side of Shiv Niwas Palace, the stream adds to the picturesque triangle with Pichola on one side, Dudh Talai on the second and M.L Verma Garden on the third. The Manikya Lal Verma Garden built on Machala Magra (hill) near Dudh Talai pond is a paradigm of contemporary architectural art. Stroll the garden, take in a panoramic view of Lake Pichola, Jag Mandir, Lake Palace and City Palace. Udaipur Solar Observatory – Located on an island in the Fateh Sagar Lake, the observatory is claimed to be one of the Asia’s largest. The observatory was built in the year 1976 by Dr. Arvind Bhatanagar following the model of the Solar Observatory at Big Bear lake in Southern California. The Celebration Mall, Udaipur is the first mall in the city offering world class shopping and lifestyle experience under one roof. Located at Bhuwana, NH8, the mall is just 5km away from the famous Lake Palace Hotel and the old city, less than 3km from Sukhadia Circle (a local attraction) and less than a kilometre from the road that leads to tourist attractions such as Mount Abu, the hill station of Rajasthan and Ranakpur, the city with the world famous Jain temples. Gulab Bagh derives its name from the abundance of rose species growing in its premises. Often referred to as Sajjan Niwas Garden, it was built by Maharana Sajjan Singh in the 1850s. Spread over an area of 0.40 sq km, it is the largest garden in Udaipur. Situated in the south-east of the City Palace complex, the garden also encompasses a museum, originally known as Victoria Hall Museum. In the museum are housed antiques, curios, royal household items and other relics from the past. Within the garden, at a short walk away through rose plants and open parks, a zoo is situated. There is a zoo with tigers, leopards, chinkara gazelle, birds, and many wild animals. Children can enjoy mini train, track of which covers the main part of the garden and the zoo. When it comes to traveling with family, tickets for a family of 4 comes down to a huge amount. But in the case of a taxi, the amount is fixed. And in case you taxi hire from Om Travel Online, you will only need to pay for the distance travelled. No return trip fare charged by them. That means you travel more and save more. Hire Taxi Services in Udaipur with Om Travel Online. For booking Udaipur Taxi Services call on: +91 8824277441. More about them! Watch out in our next article Tourist Places in Udaipur for One Day Tour.